Specifications: Material: PlasticColor: Black & Grey Size: 5.9cm x 3.4cm x 1.4cm Operating frequency: 315 MHz Features : - Latest modern design & technology equals a simply smarter and unique remote. 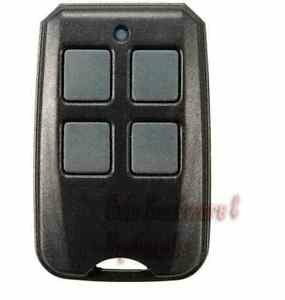 - 4 buttons to operate 4 different garage doors or gates. - This is a fixed frequency remote clonner (315 MHz) for copying 99.99% common fixed and learning code. Fitment: Fits for Liftmaster 371LM 372LM 373LM 953CD 950CD HBW1573 /Craftsman 53753 How to Program: 1. Press the two top button until the LED flashes - it takes around 3 seconds. 2. Place the cloner remote and the original remote close together/side by side so that they are touching. 3. Simultaneously press a button on your original remote and one of the buttons on the clone remote and hold them until the LED on the clone remote flashes steadily. (The Red LED will first flash 3 times quick, then stops for a second, then flashes steadily for successful cloning). 4. Programming is now successful! If you want to program more buttons simply repeat steps 2 > 4. It's that easy! To reset the remote simply start again with step 1.